In this busy, workaday world, sometimes it's difficult to make connections with people. Don't let yourself get too caught up with your plans. You have to learn to stop and smell the roses. Agents xxBLACK SKULLxx 929 and Crazy Bill Ovaert gave Ziggi Phoenix some mandatory rose-smelling time when they found him mining in a Retriever with no tank and (worse) no permit. That's not a very good way to meet someone. Or is it? Ziggi convoed xxBLACK. As you would expect, Ziggi, as a person in highsec, was already familiar with the New Order. He was even thinking about learning how to suicide gank. But he needed someone to push him in the right direction. When his mining ship was hit by antimatter, it was pushed in all directions at once. xxBLACK took the opportunity to reach out to Ziggi. He saw something in Ziggi. Something Ziggi hadn't even seen in himself, yet. Whether or not CCP considers us officially a "group of players", everyone in highsec can agree that you'll find no group of players more welcoming than the New Order. xxBLACK invited Ziggi to join his crew. Success! xxBLACK happily reported that Ziggi's alt, Cold Zig signed up and began training immediately. 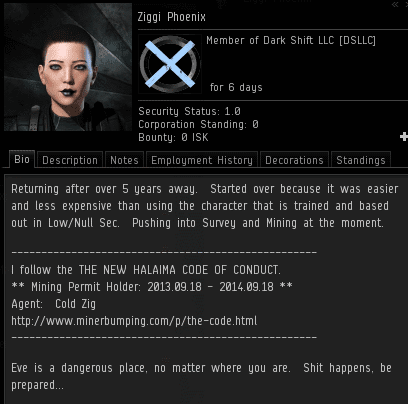 Meanwhile, Ziggi Phoenix got himself legal and began encouraging other miners in highsec to join the cause. If you've ever wondered why Agents of the Order are so friendly, look no further. Every miner we meet--with words or with violence--is just an Agent who hasn't been recruited yet. No real miner would ever pay in order to be left alone; nor would they fall for deranged sperg that is the Eve equivalent of Mormanism raised to the power of Scientology divided by the rationality of the Unabomber manifesto. Real miners can adapt location, time and activity. The bot has trouble playing when someone moves their mouse to the other side of the keyboard. Bots deserve to be ganked, miners who attract gankers by making it easy for them to be ganked, deserve to be Ganked - (that's ganked with a capital "g"). The true righteous miner rejects bottery and laughs in the face of Gankery and the Sperg of the bumper. As there is nobility in sacrificing more isk than your target is worth to trigger a killmail, such attacks are worthy of honourable reply in local or in deed. 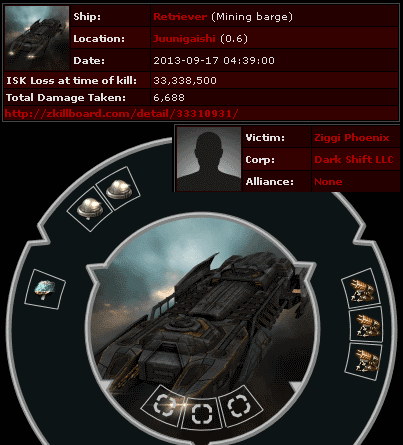 Thus the true righteous miner only uses a Procurer; cheap and tanked so that it costs more to gank than it does to replace the ship. Whereas the fallen consort in Retrievers or the yield-optimised Mackinaw, these are deserving of the Gank. i was nearly agreeing with you, but you initially threw away your whole credibility with playing the "you are a cult" card, which is a bingo square by the way. dont ruin your argumantations with anger like the "unreal miners", you are in this situation no better than the bot apsirants raging against the new order. Including the word "sperg" in your spergy rant doesn't make it not spergy; it just makes you a hypocrite. A true miner doesn't pay to be left alone. A true miner buys a permit to choose the correct side. There are gankers out there who target only those with permits--although a side benefit of choosing the morally correct side is that these anti-order gankers are terribad. I can't believe you would compare us to a cult. Now say three "Our fathers" and repent of your sins. In lieu of 3 our fathers my 'religion' merely requires me to reflect on: "Me, myself and I". Hypocrisy Watchman: A Hypocrite is a person who pretends to have moral virtue or religious beliefs he or she does not actually have. Hypocrisy is therefore the false charge of the apostate blasphemer, who has a distorted and perverted view of virtuous conduct. Yet this is a troubling notion for the nature of virtue has long held to be subjective. As demonstrated by Rene Descartes, objectivism is an illusion; the only thing that may be known for certain about the world is one's ability to think. This as shown by Immanuel Kant means there can be no objective moral right or wrong only choices and values - internal consistency and inconsistency. Duty carries its own moral necessity according to Kant, however will to choose that creates moral virtue- A good will is good only through its willing. Yet the illusion of duty has been exposed by Neitzsche who - the noble forms his morals by himself and does not look further for validation to those virtues; yet the claim of nobility is itself a moral choice. With Neitzsche we have shattered the barriers of objective good and bad - we have gone beyond good and evil. The nature of virtue is then encapsulated in the existential notion that existence precedes essence and the authenticity of ones own actions that challenges the individual's facticity. Of utmost importance for the miner or bumper is that they are individuals operating independently and acting under their own conscious judgement rather than under roles, stereotypes or pre-conceived notions of essence. The French existentialist Jean Paul Satre wrote, "We were never more free than during the German occupation." This is because the facticity of Nazi occupation of France provided any number of ways in which the authentic could demonstrate will. According to Satre "The choice that each of us made of himself was authentic because it was made in the presence of death." The authentic choice is the only virtue to the existentialist. This is why the existential or virtuous miner will never pay. Non-compliance with the occupation of France was the only virtuous choice for Sartre just as non-compliance with the NO code is the only virtuous choice for the miner. You appear to have made my case for me. The case for defying the code is self-evident and open to all to espouse. If you truly believe the case to be self-evident, that only makes your earlier sperg more spergy. I am the self-righteous and imposed king and saviour of Spergishness.... but that is merely an inauthentic stereotype; what matters is NO does not; I Will to not pay, as an express demonstration of free will. MWAHAHA!!! You guys truly are idiots! The same day that you released this, one of your members ganked me, and with a small bit of help from concord I made a 3mil profit from salvaging your useless ship! I am starting to believe the code to be true and working... As it gives me more money a second than mining does. Please gank me more often, I love salvaging your ships! You're right, the Code is true...it made you finally play the game by salvaging a wreck! Being ganked in High Sec is embarassing, but the Code always gives you a second chance. Lol! I salvaged while bot mining XD Such a fail you made.